When selling a horse, the phrase "buyer beware" applies completely. Unlike in many other transactions, a buyer of a horse has no statutory legal protection. A horse may seem sound when you view it, only to show problems shortly after you take it home. It is only natural to want to show a horse or pony in a good condition or talk up achievements, both to maximise the price and to increase the chance of a sale. The seller may not be intentionally trying to dupe you, but it is all too easy to include bute in feed or say that the horse is a good competition jumper when in fact it has only jumped in the neighbour's arena. In short, few horses are perfect and there are ways of hiding problems that a seller won't be inclined to tell you. A vet's report will give you some assurance that the horse is medically sound, but you shouldn't rely on a report alone. Vets can make mistakes, particularly since they are only looking at the horse at a point in time, and are unlikely to know about historical injuries. The only way of protecting your interests as a buyer is to use a sale agreement in which the seller warrants (makes promises regarding) the condition of the horse. If subsequently it turns out that a warranty (for example, that the horse does not spook at traffic) is false, the seller breaches the agreement, and the buyer can seek damages. If you have a written warranty and there is a problem, the problem becomes the seller's and not yours. This agreement protects both parties, but more so the buyer, who is in the weaker position without it. It has been written for standard transactions. It is a comprehensive document, but not overly legalistic or complicated to edit. you are breeding and/or showing horses or ponies. An agreement transfers much of the risk of buying back to the seller, and so many sellers will be reluctant to use them. However, as a buyer, the consequences of not using an agreement could be expensive, both financially and from not having a horse to ride. You should hear warning bells when a seller flatly refuses to warrant in writing that the horse is ok. Many people think that an agreement is too formal or legalistic, especially when the other side can be trusted. As far as possible, we have drawn the agreement so that both sides will be happy to use it (there are benefits for the seller as well). It should be difficult for the seller to refuse on grounds that it appears too technical. For example, our use of plain language (and lack of legal jargon) should ensure both sides understand the agreement, and reduce any worries about what exactly the seller is promising. 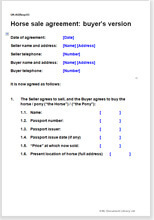 If there is a lot at risk - the value of the horse might be high or you might need the horse to be able to perform at a certain level - then we sell another version of this document that contains more warranties that the horse is sound, and more advanced provisions relating to matters such as seller's right of first refusal to buy if the buyer subsequently sells the horse. See Horse sale agreement: high value transaction. If you are the seller, you may prefer to use an agreement that still protects both parties, but that offers less protection to the buyer than this document. As a seller, using a sale agreement is a good way to reassure a buyer and close a sale, and presenting yours allows you to set the terms and warranties. See Horse sale agreement: seller's version. Equestrian legal documents are one of our specialities. The writer of this document has ridden for many years and has bought and sold many horses and ponies for recreational use, to back and sell on, and for the family-run stud. The document is carefully considered to include practical matters that a solicitor who isn't an experienced horseman would be likely to exclude. Miscellaneous legal provisions to protect both sides. Note that there are limits on what a sale agreement can do. A written agreement provides a buyer with protection if the condition of the horse isn't as the seller warrants, but it can't prevent a horse from being unsound.